Tips and plans for growing zucchini your vegetable garden. 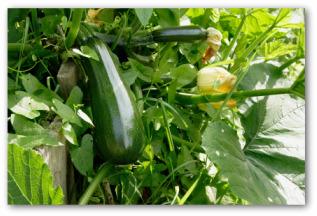 Learn how to plant and grow zucchini and other summer squash varieties. It's easy! Squash plants are so easy to grow and with a varied assortment offered, it is an easy task for gardeners to find varieties to suit their climate, garden size, and taste buds! Squashes are divided into two categories which are summer squash and winter squash (includes pumpkin). A popular choice in the vegetable garden for summer squash is planting zucchini. The benefits for planting zucchini include a short time from planting until harvest, the vegetable can be eaten cooked or raw, and high yield. Summer squash is best eaten fresh and is not intended for storage. Types of summer squash are yellow straight necked, cocozelle, vegetable marrow, crook necked, scalloped, patty pan, and last but not least, zucchini. Zucchini seeds are large and easy to handle. Plants may be started indoors or seeded directly into the ground after danger of frost is past. Many avid gardeners ensure a early harvest by planting zucchini using both techniques. Indoor planting takes place about a month before the last frost is expected. Plant 2-3 seeds ½ inch deep in individual peat pots or other biodegradable containers. These pots can be planted directly into the vegetable garden to prevent disturbing the root systems of the growing zucchini. Indoor plants should have true leaves by the time you are ready to set out the squash. They should not have formed flower buds before setting out because that will cause the growing zucchini to be weak and unproductive. If you start your seed too early and flowering starts before time to plant in the garden, pinch off flowers to stimulate further leaf growth. Zucchini plants, and all other summer squash plants, need moisture, full sun, good fertile soil, and ample amounts of organic material. Summer squash is also seeded direct in the vegetable garden. Plant 2-3 seeds per hill every 2-3 feet when the soil surface has warmed. Even in Northern gardens, there is ample time for growing zucchini for 2-3 plantings. 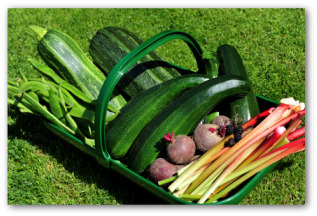 Many gardeners do not find additional plantings necessary as the original planting usually leaves you covered in summer squash until the first frost. When planting zucchini, first the plants set male flowers and then female. Then the fruit begins to swell at the base of the pollinated female flowers. Fruits will be ready to harvest early in the summer, typically 40-60 days from planting! Summer squash should be enjoyed when it is young and tender. At this stage, it can be eaten raw, skin and all. When older produce is harvested, you may need to peel the skin and cook the zucchini before eating. If you have tried every summer squash recipe in your cookbooks and are still overwhelmed with production, continue to harvest and compost the fruit so the plants will keep producing. 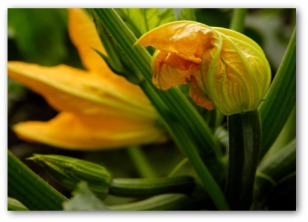 An over-abundance of growing zucchini can also be avoided in part by harvesting the blossoms. These can be dipped in batter and fried, added to stir fry, or cooked with pasta. You will be amazed at all the creative ways there are to put zucchini to good use! As a last resort, you can always make a few dozen loaves of zucchini bread to share with your friends and family for Christmas. On our family farm, my father always sliced the extra large zucchini and fed them to our milk cow Buttercup as a special treat. She really seemed to love eating some fresh zucchini along with her grain and hay!